© by Marilyn Zelke Windau. Marilyn Zelke Windau started writing poems at age thirteen, usually sitting in a quiet bathtub with a pillow. A former elementary school art teacher, she enjoys gardening and painting. Author of four books of poetry, the latest being Hiccups Haunt Wilson Avenue (Kelsay Books), she includes her maiden name to honor her father, who was also a writer. 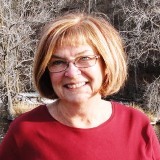 Marilyn lives in Wisconsin, where she is an active member of the Wisconsin Fellowship of Poets. This is a true 'fun' poem. I love it. It leaves me now to play with my own words in a similar pattern. Thank you, Marilyn. Thank you, Marilyn. Such wonderful images. Jayne is right. Read, reread and the smiles grow larger. You had me from "Silver flashes of sunlit birch leaves". The late W.S. Merwin typically did not end his lines with full stops--a very nice touch for this poem. Thank you, Marilyn. I found a copper penny in the post office parking lot recently. Little things that skip right by us; your poem sees the relevant.thanks? Could I suggest that each image be the spark of it's own poem? I especially liked "My portrait in a polished tabletop".